The program described here and this webpage are both experimental and under development. My main intent at this point is to determine the usefulness of such calculations in actual practice. Changes and updates are expected. Bugs, problems, omissions, reports favorable or otherwise, & etc. should be reported to the DrJack Forum. These predictions are of course dependent upon the accuracy of the meteorological forecasts! Thus they should be examined critically and evaluated using one's knowledge of forecast model limitations. Model forecasts are inherently noisy - not every wiggle can be believed! Relative comparisons will be more accurate and useful than the specific numbers provided. An advantage to these forecasts is that they are tailored to a specific area and path. Possibly their most useful feature is to provide single numbers, such as the spatial average climb rate or the "optimal flight" flight time, to evaluate conditions over a specified area. 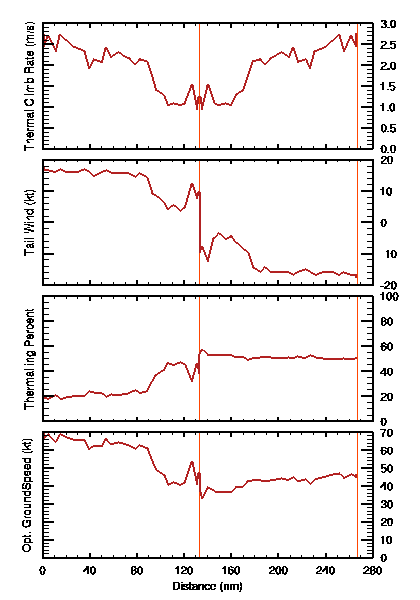 Comparison between different models, RAP and NAM, for the same path can be used to evaluate the uncertainty in the day's predictions (such comparison can easily be made for a prescribed flight track by creating two different Bookmarks, one using NAM forecasts and the other RAP - see the "Bookmark" section below). The current computations do not allow for the variation of conditions with time. Such could be added (for RAP forecasts in particular), but I first want to evaluate the usefulness of the present tool before considering adding more complexity, which might not actually make the computations significantly more useful. I urge any user of these "Track Average" forecasts to simultaneously view the Thermal Updraft and BL Wind BLIPMAPs upon which they are based! BLIPMAP graphics have the advantage of utilizing the mind's powerful pattern analysis capability to better evaluate a complex forecast, such as the spatial "noisiness" of the meteorological forecasts or possible advantages to deviations from a perfectly straight flight path. The accuracy of the "optimal flight" results depends upon the many assumptions made by "speed-to-fly" theory, which can be overly simplistic (though the foremost factor affecting accuracy is, of course, often the accuracy of the meteorological forecasts! ) "Speed-to-fly" theory assumes that a flight consists entirely of simple circling climbs in thermals followed by optimal speed glides to the next thermal (and thus omits the initial tow and final glide). Note that the only forecast parameters used are thermal strength and wind speed+direction - there is no dependence upon thermal depth or terrain or clouds (or anything else). Actual flights often use lines of uplift created by ridge lift, convergences, thermals following ridgelines, & etc. "Speed-to-fly" ignores all such lift. Existence of clouds can greatly expedite forward progress, both by marking thermals and by augmenting their strength (release of latent heat). "Speed-to-fly" ignores clouds. Deeper thermals allow faster speeds, all else being equal. "Speed-to-fly" ignores thermal depth. Unfavorable conditions at only a single grid cell can block forward progress, rendering the entire leg "impassible" mathematically (see below). In reality such a problematic region might be traversed by a long glide or by circumvention, but "speed-to-fly" does not allow such possibilities. Initial tow and final glide are neglected. "Speed-to-fly" calculations do not allow for lateral deviations from the straight-line track to follow areas of stronger lift. Thus these predictions should be examined critically and evaluated using one's knowledge of factors not included in these simplistic calculations (including forecast model limitations). Again, relative comparisons will be more accurate and useful than the specific numbers provided. BTW, interpretation is greatly enhanced if one also views the Thermal Updraft and BL Wind BLIPMAPs upon which the optimal forecasts are based! Note that an optimal flight solution does not always exist for a leg ! If the forecast thermal strength is not large enough to keep the glider aloft or to allow forward progress for the given wind conditions at a single grid cell along the leg, then no optimal flight exists for that entire leg. In such a case dashes will be displayed in the columns giving optimal flight results for that leg (and for the total). Note that while unfavorable thermal/wind conditions at only a single grid cell can render the entire leg unfeasible mathematically, in actuality the flight may often be possible. In reality such a problem area might actually be passible, through a long glide or circumvention for example, particularly if the path through that grid cell is shorter than a full grid width - but the simple mathematical assumptions used do not allow that possibility. The along-track plot will indicate the location of such problematic conditions, as the optimal ground speed will be 0 and the thermalling percentage 100%. If you wish, the optimal flight forecasts can be altered or "tuned" by changing the tmult input parameter, which multiplies the predicted "Thermal Updraft Velocity" values. Ideally that factor would be 1, but the method of predicting thermal velocity has some slop in it due to questions about the applicable averaging time so in fact the "best" theoretical value may not be precisely 1. However, determining a true "best" value would not be a simple task since it would require excluding all factors which can bias the results - one would need a day on which meteorological predictions proved reasonably accurate with many flights which approximate the simple "speed-to-fly" model being flown by skilled pilots. Simply altering the predicted optimal flight time using this factor assumes that any error in the optimal flight prediction results from thermal strength forecast errors, which may not be the case! You may find a value differing from 1 which better predicts enroute flight times, but that does not mean that that number is applicable to everyone and all circumstances. While the optimal flight numerical values can be used flight planning, this is useful only when its simplistic assumptions reasonably match the actual gliding situation, as when simply moving from one thermal to the next over flat terrain directly toward a goal. I have strong doubts about the exactness of the precise numerical values, given the methods simplicities plus the inaccuracies and uncertainties inherent in meteorological modelling. And in addition there are pilot variations - everyone knows that two different people can have two quite different times over the same track on the same day! My expectation is that these forecasts will be most useful in indicating relative differences between days over a given area, not for telling exactly how long it will take you to fly a given route! Still, I don't fly in flat terrain where this theory is most applicable so am not in a position to truly evaluate it - that I must leave to others. I would be interested in hearing of any useful comparisons between the optimal flight forecasts and actual flights. By useful I mean results which provide scientifically appropriate comparisons, that is: (1) omit flights which do not roughly match the simple "speed-to-fly" model (e.g. not over flat terrain), (2) omit days on which there were obvious failures of the meteorological forecasts (e.g. an unforecast intrusion of high-level clouds), (3) cover multiple days (to average out the inherent "noisiness" of any single day/flight). Ideally they would even be for more than one pilot! The text summary indicates that for NAM model forecasts for the current day at 21z, the simple spatial average along the specified route (an out-and-return) is for a climb rate (Thermal Updraft Velocity minus Thermalling Sinkrate) of 2.0 m/s. An optimal flight by a LS-3 would experience an average climb rate of 1.9 m/s on both legs, indicating less time spent in regions of stronger updraft. The outbound leg has a tailwind, on average, which becomes a headwind on return. The distance of each leg is shown with the time, ground speed, air speed, and percentage of time spent thermalling for each leg. On the tailwind leg, a lower airspeed when gliding is required for optimal flight, yet the actual ground speed is higher and less time will need to be spent thermalling. The plots indicate how conditions vary along each leg - though these details need to be taken with a grain of salt, realizing that predictions at a single grid point, as these are based upon, can be very noisy! For this case, they show that forecast variations of thermal strength and tailwind result in thermalling percentage and optimal groundspeed varying significantly along the outbound leg. Note that if conditions at one grid point produce a groundspeed of 0 and thermalling percentage of 100%, the leg as a whole has no optimal solution! A leg average tailwind of zero, or close to it, does not mean that the wind is near-zero over the entire leg! I once puzzled over why I was getting different results for the two legs of an "out-and-back" track with zero average tailwind, only to discover upon detailed examination that there was in fact a wind which reversed direction near mid-leg - while those canceled in the spatial average for each leg, they produced different optimal velocities for each since the thermal velocities varied significantly along the leg so weak thermal velocities were associated with a head component for one leg but with a tail wind segment of the return leg, acting as a "chokepoint" which made the latter a more difficult leg. When headwinds are strong enough to greatly reduce ground speeds, a small change in wind speed or thermal strength can produce a large change in the optimal ground speed and leg travel time. I'd like to emphasize that unfavorable conditions at only a single grid point can block progress along a leg when using "speed-to-fly" assumptions, rendering the entire leg "impassible" mathematically. For example, one track out of Truckee CA gave "no solution" even though the track's spatial climb rate was 2.8 m/s with no wind, on average. Detailed examination found that the Truckee point was affected by adjacent Lake Tahoe which, as a water surface, squelched lift and made that grid point impassible mathematically even though the rest of the route had quite favorable conditions. In a case such as the previous one, where the launch/land location experiences relatively unfavorable conditions, a more realistic solution can be obtained by starting the track from the release-from-tow location and ending it at the point where final glider commences. This is necessary to compensate for the fact that the simple speed-to-fly assumptions used here do not consider initial tow or final glide, can allow the pilot to be relatively unaffected by poor soaring conditions close to the airport. Note that "optimal flight" results are flight averages so their thermal and wind magnitudes are weighted more heavily by regions where the ground speed is smaller (as will occur with weak thermals or a headwind) just as on an actual flight. First load a (non-composite) forecast page. [Note that the browser must have valid DrJack cookie for access.] A good choice is the "Thermal Updraft Velocity" since the optimal flight time depends mainly on that parameter. But any non-composite map can be used since the map is only used to set the flight track turnpoints. Click on Toggle "Calc TrackAvg" to display the track averaging input selectors. Activate (check) the "Add to FliteAvg Lat,Lons" Popup checkbox so that mouse clicks on the image will be saved as latitude/longitude points. You may wish to un-check the other Popup checkboxes to disable those Popups. Click on the screen at the location of your desired first track point. Then repeat for other points along the track. Note that the small window displays the number of points in your selected track as you progress. Once added, individual points cannot be deleted - you must instead clear all the points using the "Clear LatLons" button. Select the desired glider Polar. Select a "ThermallingSinkrate", which is your estimate of the glider sink rate when thermalling. Additional optional choices are selection of a ballasted glider (for certain gliders), and a multiplier of the forecast thermal strengths. See the "Program Parameters" section below for further information these choices. Click on "Calc FliteAvg" button to display a popup window containing the computed Optimal Time and Speed for that flight track and the average meteorological conditions along the track. For a new calculation, you can alter one of your existing settings and re-click the "Calc FliteAvg" button. Note that prior to selecting a new path you must click the "Clear LatLons" button. Note that you can click on "Save Setup" button to save your settings (except for the flight path) between sessions. Flight track and glider-specific data can be specified in a browser URL, with output being displayed in the browser. Since the required URL is a long one, it is usually most convenient to store a specific path as a bookmark, which when loaded into the browser will display the optimal flight time and speed and average meteorological conditions for that path based on the latest model forecast data. Alternatively, browser-mimicking software can be used to send the desired URL and receive the output. It's easy to make mistakes in such a long URL. So it is often best to save it as a Bookmark - then you only have to create the needed URL once for a given path and glider and forecast model/time ! Test what you've input to make sure it works (for RAP this must be done when current day data is available), ensuring the numbers in the output header lines is correct. When it is satisfactory, save that URL as a browser Bookmark. If you create several, give each Bookmark a distinctive name so you will be reminded what it is for. The following parameter information is used when using a URL to produce Track Average predictions. Note that the URL should contain no blanks and no quotation marks. The order of the arguments is optional, so long as the first is preceded by a "?" and the others by a "&". A sequence of Latitude,Longitude pairs in decimal degrees and separated by commas, e.g. 39.00,-117.00,41.00,-116.00,39.00,-117.00 The track must be entirely contained within the chosen region's perimeter. A comma may be optionally included after the last value. Note that a "West" longitude must be a negative value. Glider weight information, which alters the glider wing loading. This number multiplies the wing loading assumed by the existing glider polar coefficient data. However, the special value -1 uses the fully ballasted weight from pre-stored glider data. If omitted, a default value of 1 is used. Glider sink rate while thermalling (m/s). Depends upon the glider, bank angle, thermalling technique, etc. If omitted, a default value of 1.0 m/s is used. Multiplier for Thermal Updraft Velocity forecast. Can be used the "fudge" the results if desired, but normally this is set to 1. If omitted, a default value of 1 is used.